…and middlemen seem to make more money from RECs than renewable power producers do. Private homeowner association rules can frustrate desires of persons wanting to go solar. Local government zoning regulations and associated red tape hamper solar developments. And if you fail to show up for the county board of supervisors meeting … well, at least in Mohave County, AZ, if you want a permit you best show up at the meetings. 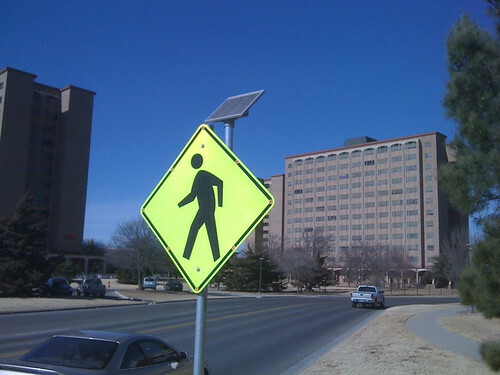 Distributed solar power generation unit on the Texas Tech University campus. Call me when they have solved the problem of the sun going away every night. They have! The unit displayed includes a small battery, the traffic sign it is attached to will blink into the darkness! So, in some locations, for low power, off-grid applications, solar can compete. Lubbock gets pretty good sunlight most of the (day) time.